We've had a lot of fun lately with story telling, including our adventures with Disney for their Fit to Dance programme. My little ones love stories and story telling, so the Story Fest at St Enoch Centre sounds brilliant (it's just a pity that we're going to be sunning ourselves in Portugal!). The St Enoch Centre is inviting you and your children to 'Story Fest' during the October holidays. 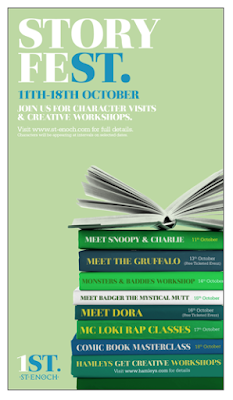 Story Fest is a 9-day festival dedicated to children's literature running from Saturday 10th to Sunday 18th October with loads of activities from character visits from Dora and The Gruffalo, to creative workshops. The most exciting event is 'Badger the Mystical Mutt'... Badger is a 6ft dog with a nose for adventure and he takes children on a magical journey involving songs and story telling. Badger is the star of a series of children's books exploring various issues, including bullying. Join Glasgow hip-hop star Darren McGarvey - aka Loki - and create your very own rap... suitable for ages 11-16 years. Badger the Mystical Mutt runs in the St Enoch Centre on Thursday 15th Oct from 12-1pm and 2-3pm and is suitable for children 5-8 years old. All events are free, but some are ticketed and must be booked in advance.